For a long time universities have been chastised as being ivory towers, their academic pursuits seen as divorced from the daily lives of people in the communities they share. This stereotyping began to diminish as the 20th Century progressed and universities in the developed world found themselves increasingly allied with businesses or governments to engineer social or scientific solutions. Women at a World Association for Christian Communication event in Haiti, cosponsored by WAND. Academic purists criticize this model supposing a loss of intellectual rigour and independence. The University of the West Indies (UWI), more than most, was founded with an academic mission integrated with the idea of shepherding a Caribbean development model. But this did not compromise its commitment to intellectual rigour and independence. The Women and Development Unit, located within the School of Continuing Studies’, is perhaps most representative of UWI’s conscious efforts to integrate itself solidly within the communities it serves. “This was the major part of the vision that Professor Rex Nettleford had in agreeing to establish WAND within the School of Continuing Studies,” said Dr Judith Soares who as Tutor/Coordinator took on responsibility for managing WAND in 1995. Sybil Francis and Phyllis Macpherson Russell were instrumental in founding WAND and Peggy Antrobus was its first Tutor/Coordinator, who laid the basis for its growth. Soares is no less enthused now than when she assumed the role in the unit whose spectrum covers activities in Barbados and the Eastern Caribbean. WAND’s work in continuing education and sustainable livelihoods is well demonstrated in the communities of La Pointe, St Lucia and Fancy, St Vincent and the Grenadines. Starting as early as 1981, these combined skills training and social awareness with the development of income generating projects, the benefits of which redounded to these communities as a whole. Originally technical assistance was provided to women’s groups and bureaux using the Integrated Rural Development model as a means of integrating women into the development process. Beginning December 1995, a new approach was taken through WAND’s newly developed Communities Organising for Self-Reliance (CORE) concept. “In this approach, WAND saw its role as working directly with communities or through intermediaries. 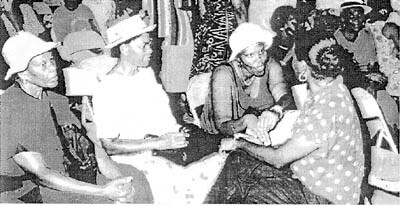 The latter was expected to assist in capacity building of national organisations, while the former which would take the form of working with community-based organisations would encourage community members to initiate, manage and sustain programmes and projects that could be the basis for community self-reliance,” explained a report by Soares and Sheree Trotman, on the unit’s work between 1995 and 2005. Workshops and training in disciplines such as leadership, management and project development buttressed the funding and technical support provided to the communities in areas such as education, farming and eco-tourism development. Beyond the CORE project, WAND continued interactions with the wider Eastern Caribbean through conferences, seminars and workshops – either on its own or in cooperation with other bodies – which contributed to the philosophy of empowering communities by empowering women. Some of these explored topics such as “Gender, Spirituality and Communication”, “Women and Entrepreneurship”, “Women, Drugs and the Media” and “Gender Mainstreaming in Caribbean Single Market and Economic Partnership Agreements,” among others. A prime example of WAND’s delivery in the area of education and training was the two-year project, Strengthening Women’s Reproductive health in the Eastern Caribbean, which graduated 121 trainer of trainers in Dominica, Grenada, St Lucia and St Vincent and the Grenadines. About 27,700 community members were reached directly. There were also workshops on “Women and the New Information Technology: Access and Use” and training in the production of Rdaio Programmes under a Women Speaking to Women project. Between 1999 and 2004, a new quality was brought to WAND’s work with the introduction of an affective education programme for students at the Bay Primary School, Barbados, and a parenting project for the parents of these children. Under the theme – Parenting the Naked Truth: Enlightening, Encouraging and Empowering Parents to Cope with the Everyday Challenges of Child Rearing in the 21st Century four workshops were held for parents and two of which targeted fathers only. Much of WAND’s work has resulted in publications, reports and papers that contribute to UWI’s academic and teaching activity. “At the start I got a mandate to reintegrate the work of the unit into the university by creating an academic link to the NGO community,” said Soares who emphasised combining academic theory and non-academic work. “We have incorporated women in religion, women with disabilities and tackled a wide range of issues. “Professor Elsa Leo-Rhynie gave critical advice and has been always helpful in programme development,” said Soares who also identified UWI Cave Hill Campus Registrar, Andrew Lewis, Campus Bursar, Maurice Webster and Assistant Registrar, Appointments, Henri Brewster as being of immense help in making the unit’s work possible. An aspect of WAND of which Soares is particularly proud is the library which has been transformed into a specialized women’s unit with more than 7,000 titles. “Apart from the support which we got from Senator Velma Newton, of the university’s Law Library, she referred me to Ingrid Iton who started the process of setting up the specialised library which is now first class,” said Soares. When one considers the difficult financial times it has had to be steered through, Soares has been remarkable in leading the Unit in its community work and adhering to excellence in academic standards. And the UWI can justly be proud that WAND gives the lie to those who may claim that its teaching and research benefits only an elite minority as the unit stays close to low income, unemployed and socially disadvantaged women.